Sajidul Islam is a Bangladeshi cricketer. He was born on 18 January 1988 and is a right-handed batsman and left arm medium fast bowler. He played for Bangladesh Under-17s in 2003/04 and represented the Bangladesh Cricket Board Academy in 2006/07. He made his debut for Barisal Division in 2005/06 and took an impressive 40 first class wickets in his first two seasons in the game, with a best analysis of 5 for 61 against Dhaka Division. In December 2007, he was called up to the Bangladesh squad on tour in New Zealand as a replacement for the injured Syed Rasel. On 4 January 2008 he made his Test debut, he took 2/71 which included taking a wicket with his second ball in Test cricket. Find Sajidul Islam profile and stats of batting, bowling and fielding including latest updated news of Sajidul Islam, videos and images at Hamariweb.com. 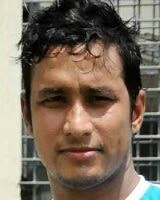 Also find detail Player profile and career statistics of Sajidul Islam of Bangladesh. Sajidul Islam - Find Sajidul Islam of Bangladesh Cricket Team complete player profile, number of matches, runs score, wickets & catches, Statistics, Records, Sajidul Islam Latest News, Sajidul Islam Videos, Sajidul Islam Photos, and other Sajidul Islam Cricket Team players.